Emma Steinbakken is THE new young exciting talent to come our of Norway. Hailing from Jessheim, just outside of Oslo, she’s been singing all her life and writing stories & poems since she was 10. In the fall of 2017 she played the lead role in the musical Annie. It was the turning point that sparked her desire to pursue a career as an artist even further. In November 2018 Emma Steinbakken released her first single ‘Not Gonna Cry’, co-written & produced by Skinny Days. The track has passed 4.5 million plays on Spotify & is certified gold in Norway! This year Emma has spent much of her time in studios, both with Skinny Days and Ole Torjus (Cezinando) and since released two more tracks ‘Without You’ and ‘Young’. 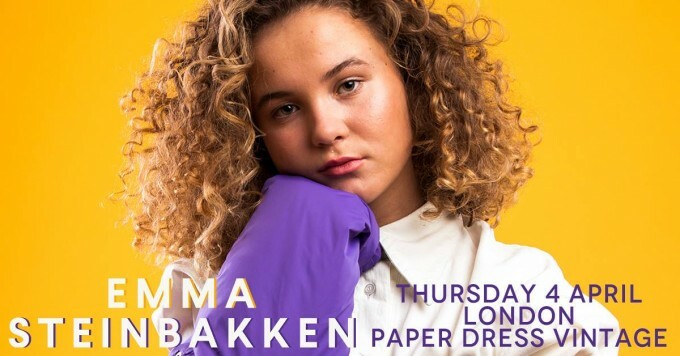 Emma made her live debut at bylarm at the beginning of March, which was a huge success, garnering a large amount of industry interest. More releases are planned in the coming months plus she is booked to play several festivals in Norway and Sweden, making 2019 look like an extremely exciting year for Emma!